Electrify Asia is one of several projects that launched into a depressed market earlier this year and has been sitting either at or below its ICO price (in USD) since launch. Despite this, it bears all the hallmarks of a potential large gainer. 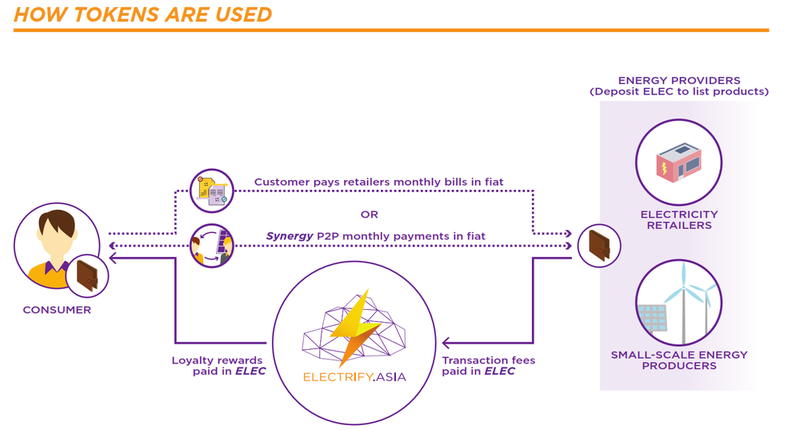 Electrify SG is a Singaporean based company providing a retail electricity marketplace now aiming to develop a decentralised and blockchain based energy marketplace (called Electrify Asia, henceforth Electrify). This marketplace would allow consumers to purchase their electricity directly from energy retailers (the large firms) and independent producers (e.g. households who generate surplus power through solar panels) over blockchain. Through this marketplace, the project aims to bring down the price of electricity to the average consumer. Marketplace: The Marketplace will be a web and mobile platform providing consumers with access to Electrify’s services. It will list parties offering electricity and allow users to buy from the best priced supplier at any time. Once a consumer selects a supplier, a smart contract is opened which enforces payment and supply. This has two core benefits. Firstly, it allows all users to have an immediately accessible and indisputable record of energy usage, spend and fees. Secondly, it allows energy providers to reduce overheads by reducing administration costs. The Marketplace will also enable Electrify’s ‘Auto Switching’ service which can automatically change a consumer’s electricity provider according to the parameters they have set (e.g. cheapest, cleanest energy, source of energy, customer service etc). This reduces user burden. Each country that Electrify moves into will have different regulatory standards. To this end, the Marketplace will have differing SDKs per country to comply with regulation. These will be open source, so energy providers are able to create customised energy plans. Synergy: Synergy is the project’s smart contract platform which enables peer to peer transactions between the independent producers previously mentioned and consumers. Electrify claims that independent producers have essentially been barred from attaining price certainty when selling electricity as they do not have access to Contract for Difference (CfD) contracts (essentially a CfD enables both seller and buyer to end up with fixed/predictable price of energy over the contract term). Synergy aims to bring CfDs to the masses, allowing independent producers to register and list surplus energy onto the Marketplace and trade with other energy producers. This enables small producers to attain price certainty over periods of time. PowerPod: A piece of hardware intended to track electricity production data by reading smart meters and logging production onto the blockchain. This provides a transparent/real time monitoring of energy production. Consumers can also make use of it in a similar vein to Hive or other consumer energy products. It will monitor a consumers energy usage to better understand usage patterns. The team intends to launch a beta version of the Marketplace and eWallet in Q3, with Synergy and PowerPod following shortly thereafter in Q4. From a real world usage perspective there is a lot to like about the potential of decentralising energy networks. Although energy markets remain heavily regulated on the whole, there are signs of change. Electrify has the capacity to tap into Asian markets which are increasingly liberalising the electricity market. Japan did so in 2016 and Singapore is extending the current pilot Open Electricity Market in Jurong to the rest of the country later this year. This liberalisation will open up opportunities for new players. From a crypto perspective there is also a lot to like. Electrify’s market cap is substantially lower than other energy based projects such as WePower ($65m) and PowerLedger (c. $180m). Energy based projects have tended to do well. The presence of OmiseGo CEO Jun Hasegawa as an advisor and investor to the project is also a positive addition. If you believe (as I do) that OMG will perform well this year both in terms of price appreciation and product adoption then it is not a stretch to think that the link with OMG will lift ELEC up too. I invested initially solely because of his presence (and the dip in price post ICO) as the attention it brings is invaluable to the lower cap projects. Electrify are also building their solution on top of OmiseGo and, judging by comments from co-founder and COO Martin Lim, are being given access to OmiseGo’s current work and developments. Electrify’s partnerships extend further than just the crypto world; a piece of news that initially went overlooked (at least price wise) was the Memorandum of Understanding Electrify signed with TEPCO, the largest electric utility in Japan and the fourth biggest worldwide. MoU’s do not necessarily mean that ELEC is poised to be rolled out in Japan or there is a formal partnership with TEPCO. However, liaisons with energy providers is going to be key to making inroads in new energy markets and should be seen as a positive step forward for Electrify. The team has also signed an MoU for joint research with the National University of Singapore into energy management and trading with blockchain technology as well as PV-related technology for distributed power generation. I am not an expert on energy markets in my home country, let alone ones halfway round the world. My instinct is that it will be a slow and very tough to break into electricity markets, despite increasingly favourable market conditions. Consumers are lazy and a lot of regulatory bodies efforts to increase the ease of switching suppliers has led to negligible results. People frequently disregard ongoing bills such as energy statements and do not expend much effort in a search to reduce costs. I also think that there will be tough regulations (despite the deregulation currently happening) and increasing competition from suppliers when faced with the realisation that they have to do something differently to retain customers. Cryptoassets in general face regulatory battles worldwide, and that is before the electricity market is added into the mix. The team are not blind to these regulatory challenges and have covered them in detail, but there will always be issues when opening up operations in new countries (the team has Japan, Australia and the Philippines listed in addition to Singapore as a focus for 2018 and 2019), especially when the company remains a small one against the existing energy giants. That said, Electrify has already signed up a number of businesses to use its service since launching last year, and Singapore is a perfect country to begin operations from given the pro-business leanings and the commitment to fully liberalise the electricity market in 2018. The partnerships signed in a short period further legitimise what they are trying to do and highlight their connections. Electrify raised $30m at ICO, with the ratio being 0.000085 to ETH ($0.08 per token). I have had to amend this section since I initially wrote it last week owing to rapid price appreciation. The market cap has risen from $25m to $40m and the ETH ratio has moved from 0.00014 to over 0.00020 as of writing, breaking out from a month-long spell of moving between 0.00012-16. I have noted before that I am currently trying to invest in projects which have not already seen rapid price appreciation and which have likely been suppressed since the market collapsed in January. Electrify falls into this category. It remains fairly under the radar (although awareness has certainly picked up rapidly in recent weeks and it can in no way be considered a micro-cap/unknown project) but the presence of OMG’s Jun and forthcoming events such as the Reddit AMA this Friday will begin to change that. It is valued at considerably less than other energy projects and has the benefit of the partnership with TEPCO. I think we will see ELEC continue to rise rapidly in the coming months, particularly as it gets added to new exchanges (which I think is a near certainty as I expect volume to ramp up). I am not sold on ELEC’s chances long term and I try to stay out of projects which I think face an uphill battle with existing parties, regulatory bodies and have a difficult route to mainstream adoption. However, ELEC offers such good immediate prospects that I think it is a good hold for now, particularly as the market starts to recover. I think it will get to $100m market cap sooner rather than later and expect it to outperform ETH in the next 4-6 weeks. I would then expect a lull, as the next real deliverable is the Q3 beta launch of the Marketplace.